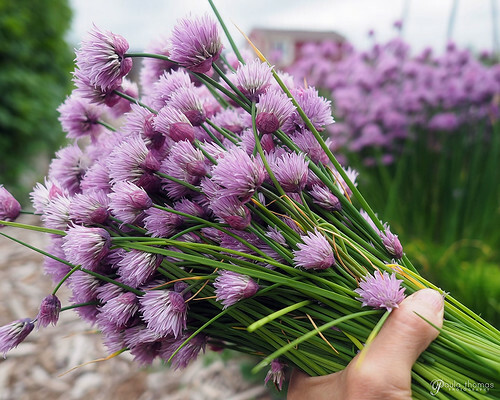 Did you know the blossoms of chives are edible? I have never used them for anything before but last year heard about making chive blossom vinegar and decided I had to give it a try. I enjoyed it so much that I decided to make it again this year and will most likely continue making it every year. You can also separate out the individual blossoms from the flower ball and use as a garnish. I like adding them to the tops of salads. 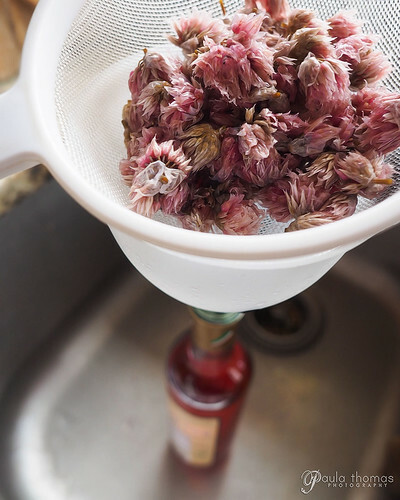 Making chive blossom vinegar is one of the easiest things. I got lots of questions about it when I posted it on my social media so I decided I would do a blog post on how I make it. You can use pretty much any vinegar you'd like but my favorite to use is white wine vinegar. Several weeks before the blossoms came out, Napolean organic white wine vinegar went on sale at my local PCC Market so I stocked up on it, knowing I'd be needing a lot of it soon. Love the color the chive blossoms give the vinegar. You'll notice the chive blossoms also change color, from light purple to pink. The vinegar makes a great base for salad dressings, which is what I use it for. 1. Harvest chive blossoms that have recently blossomed and put in a bowl with water and swish around to remove any dirt and bugs. Drain the water and pat the blossoms dry or run them through a salad spinner. 2. 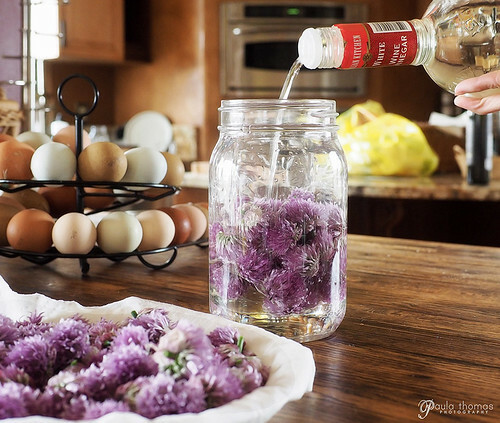 Pack the chive blossoms 3/4 to the top of a 1 quart glass jar and fill jar to the top with white wine vinegar, or other vinegar of your choice. 3. Cover jar and let sit at room temperature, out of direct sun light, for 2 weeks or longer. 4. Strain the blossoms from the vinegar and pour into original vinegar bottle and store in cupboard and use within 12 months.